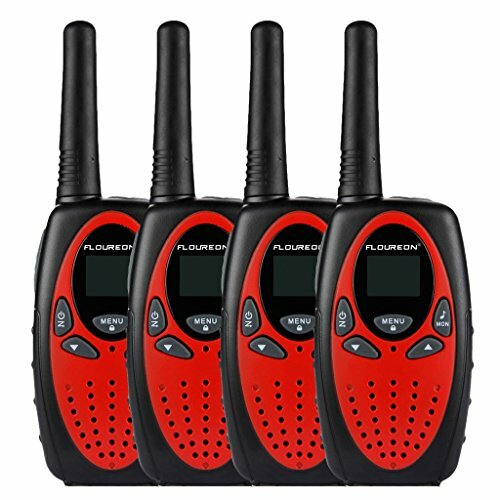 Warranty: All Floureon walkie talkies have 1 year warranty, 100% satisfaction and zero hassle returns guaranteed. Channel: 22 channels with PMR system, simple and fun to use (No batteries included). LCD backlit display, battery status indicator. Range: Up to 3000m/1.9mi (MAX 3.1mi in open field). Adverse weather, car(Iron material), voyage and buildings(yard, street) will affect the range. Adjusting power to 1W will be helpful. Sound: Good sound quality with adjustable volume level. Stay connected with friends and families.